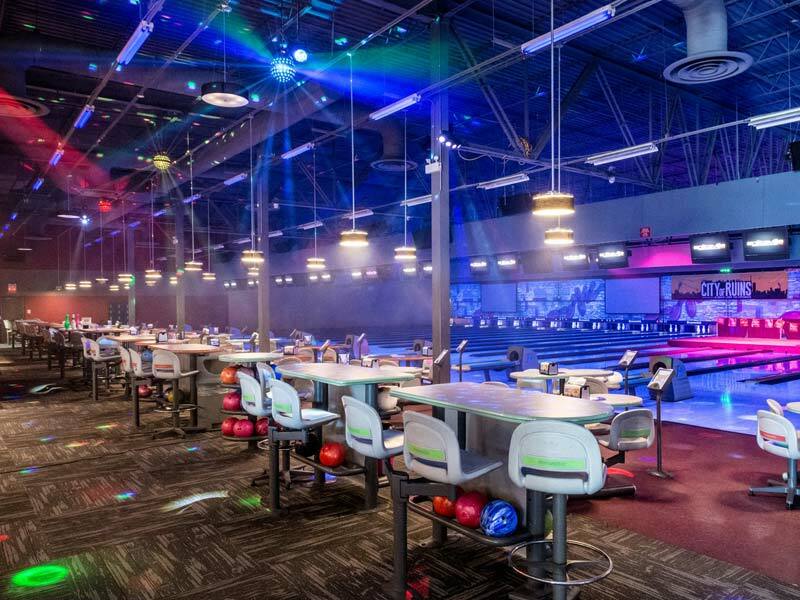 24 lanes, Glow in the Dark Bowling, 2-level laser tag arena, state-of-the-art arcade, large redemption prize store, DARTSLIVE, pool table, full-service restaurant, private party and meeting rooms, VIP area at lanes. Plus get $10 off your next visit by signing up! Prices are per hour, per lane. *All prices valid for walk-in only and are subject to change without notice. Certain rates may not be valid on holidays/events. Taxes not included. Different rates apply for our premium online reservation service. Click the button above to view online rates. Taxes and shoe rental not included. All You Can Bowl maximum 6 people per lane. All specials are walk-in only, no reservations, and subject to availability. Cannot be combined with any other offer or discount. May not be valid on certain holidays and special events. Sunday special not valid on long weekends. Not valid during March Break. 1/2 price arcade valid for non-redemption games only. 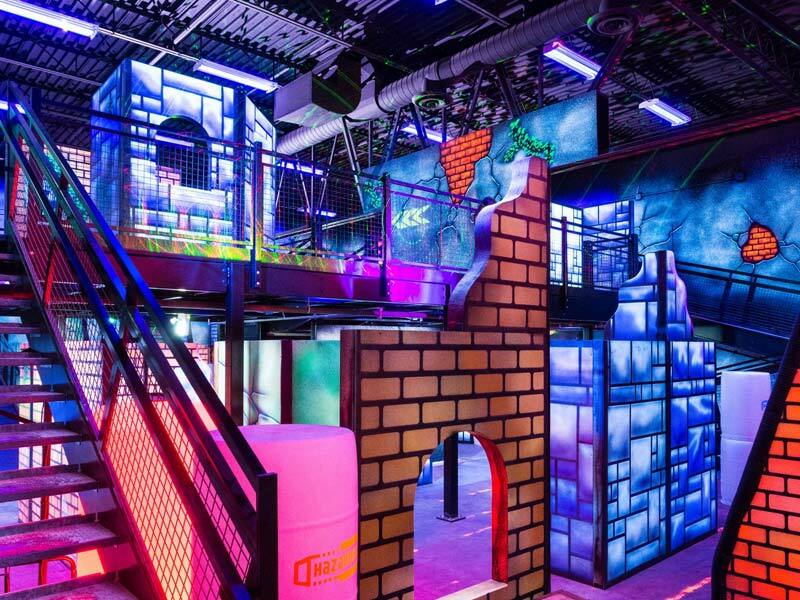 The City of Ruins is Burlington’s only laser tag facility. Multiple game modes. 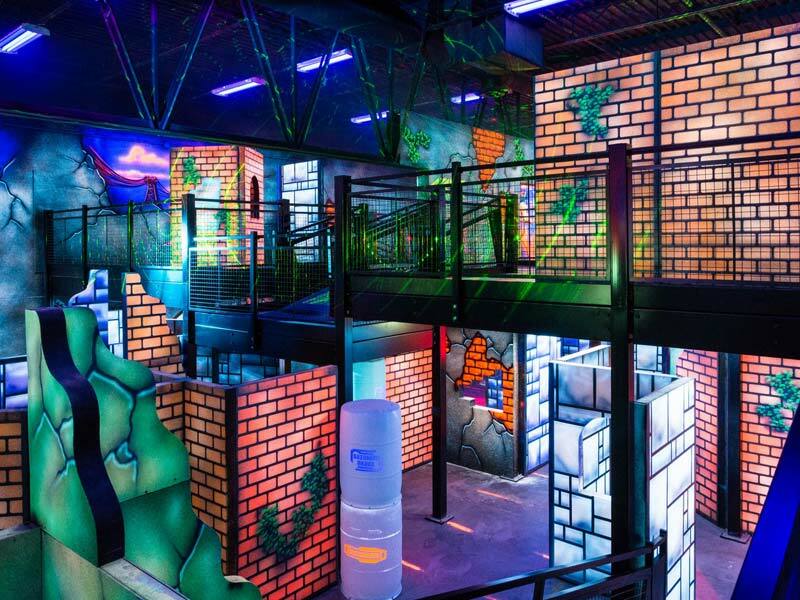 Battle one-on-one or in teams in our state-of-the-art, two-level, blacklit laser tag arena. Birthdays at Splitsville make a lasting impression. 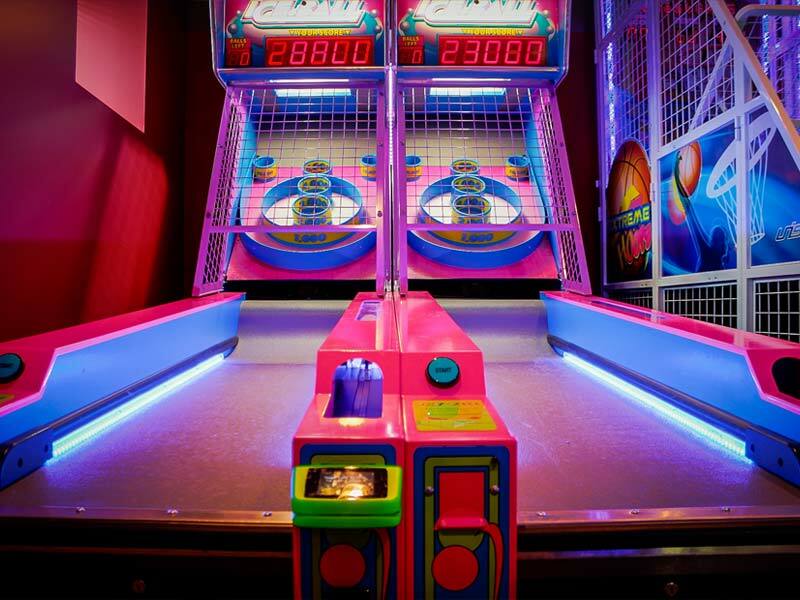 Kids love all the activities Splitsville has to offer and parents love that we take care of the setup and cleanup so all they have to do is show up! Kids of all ages can have a great experience with our optional ramps, bumpers, and lightweight bowling balls. Packages are priced for up to 6 children. Additional children can be added for an additional cost. Reserve your party date and time now! 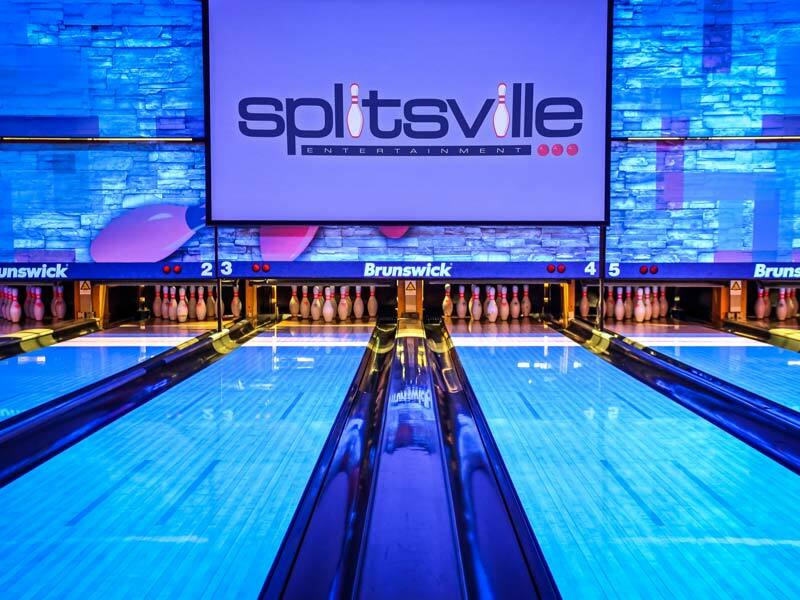 At Splitsville, we have everything you need to make your party a success: great music, big TVs, delicious food, an impressive drink menu, private party spaces, and loads of exciting games to keep your guests busy and having a great experience. Looking for the perfect venue for your milestone birthday, surprise party, retirement party, stag and doe, company holiday party, or end-of-season team banquet? Contact our party planning specialists to start creating your customized event! Get $10 off your next visit and receive exclusive coupons and offers in your inbox! Crisp corn tortillas smothered in melted cheddar and mozzarella cheeses. Topped with fresh tomato, lettuce, green pepper, and green onion. Whipped sour cream, jalapeños, and a salsa on the side. Add grilled chicken option available. Warm grilled flour tortillas loaded with southern spiced pulled chicken, fresh tomato, green peppers, and melted cheddar cheeses. Served with jalapeño slices, green onion, whipped sour cream, and salsa. Soft inside and crispy on the outside, this classic plank cut fry is seasoned with our own Splitsville fry seasoning. Tossed with creamy garlic and shaved Parmesan. Traditional Style, cheese melted below our bold beef gravy. Melted cheddar and bacon topped with sour cream and scallions. Hot, smooth and creamy spinach dip accompanied by lightly toasted naan bread and crispy corn tortilla chips. Garnished with tomato and green onion. Dill spears, breaded and fried, served with a southwest ranch for dipping. Crispy Buffalo-style cauliflower “wings”. Served with blue cheese dip, fresh cucumber slices, and a sprinkle of green onion. All on top of iceberg lettuce and tomato with ranch dressing for dipping. Soft flour tortillas stuffed with crispy chicken breast, Nashville sauce, lettuce, sliced dill pickle, crispy celery, fresh tomato, and a drizzle of creamy ranch. French fries, mini pepperoni pizza, onion rings, and chicken quesadillas. Salsa and ranch for dipping. Chicken fingers, stacked nachos, chicken quesadillas, and french fries. Plum sauce and ranch for dipping. 8 wings, 4 beef and cheddar sliders with cheese, french fries, mini pepperoni pizza, breaded pickles and ranch dip. Crisp Kentucky seasoned tender breaded chicken breast. Smothered in your choice of wing sauce. Served with french fries, celery sticks, and creamy ranch or plum sauce for dipping. Traditional buffalo-style chicken wings tossed in your choice of wing sauce. Served with french fries, celery, and either ranch or chunky blue cheese for dipping. Our haddock is hand-battered in house-made beer batter. Transitional style tartar sauce and creamy coleslaw. Fresh lemon. Greens and grilled chicken tossed in a southern style ranch. Crowned with cheddar, fresh diced tomato, crisp green pepper, sliced green onion, and crispy corn tortilla strips. Tender romaine blended with crisp iceberg all tossed in your choice of dressing. We gently lay atop the bed of greens a medley of diced tomatoes, sliced cucumber, and fresh green pepper. Starter size available. Crisp romaine and creamy Caesar dressing tossed and topped with Parmesan, bacon, and zesty croutons. Starter size available. Crisp lettuce, tomato, dill pickle, red onion, and mayonnaise. Laying on the patty is melted Canadian cheddar and smoked bacon strips. Tucked under is crisp lettuce, tomato, dill pickle, red onion, and smooth, cool mayonnaise. A Cajun spiced patty, melted cheddar, crisp lettuce, smothered in honey BBQ and southwest ranch with a pile of onion rings on top. Warm grilled chicken breast, slices of smoky bacon, smooth mayonnaise, shredded lettuce, and ripe sliced tomato are placed between three slices of toasted whole wheat petit panini sandwich bread. Lightly breaded chicken tenders tossed in medium sauce surrounded by shredded cheeses, iceberg lettuce, and diced tomatoes. We pour on creamy ranch and roll it all up in our soft flour tortilla. Hoagies are stacked with a trio of meats – smoked bacon, pepperoni, and forest ham. The fresh panini bun is then layered with mayonnaise, crispy iceberg and sliced tomato. Creamy Italian dressing is drizzled to finish. A bounty of fresh celery, cucumber, tomato, lettuce, green pepper, onion, and a little mozzarella. Add a touch of mayonnaise and a sprinkle of balsamic vinaigrette and it’s all rolled up in our soft flour tortilla. We bake a beer-battered chicken breast with St. Louis Style BBQ sauce and mozzarella cheese. This is all placed in a grilled panini bun stuffed with lettuce, bacon, hot sauce, and onion rings. Pizza mozzarella, Black Forest ham, double crumble bacon, and sliced pepperoni. Shredded marble cheese, crispy chicken, fresh tomato, crispy celery, Buffalo wing sauce, and ranch dressing. Pizza mozzarella, diced tomato, sliced button mushrooms, green pepper, and sweet red onion. Pizza mozzarella and sliced pepperoni. Pizza mozzarella, pepperoni, bacon crumble, diced green peppers, and mushroom. Pizza mozzarella, bacon crumble, hot sauce, fresh pineapple, green peppers, and BBQ sauce. Pizza mozzarella, Black Forest ham, and fresh pineapple. Crisp Kentucky seasoned tender breaded chicken breast is served with plum sauce for dipping. Individual sized cheese and pepperoni pizza. Two mini beef burgers with cheddar cheese on sesame seed buns. Cheese and grilled chicken in a flour tortilla. Cheddar cheese melted between two slices of whole wheat bread. 1525 Stone Church Rd. 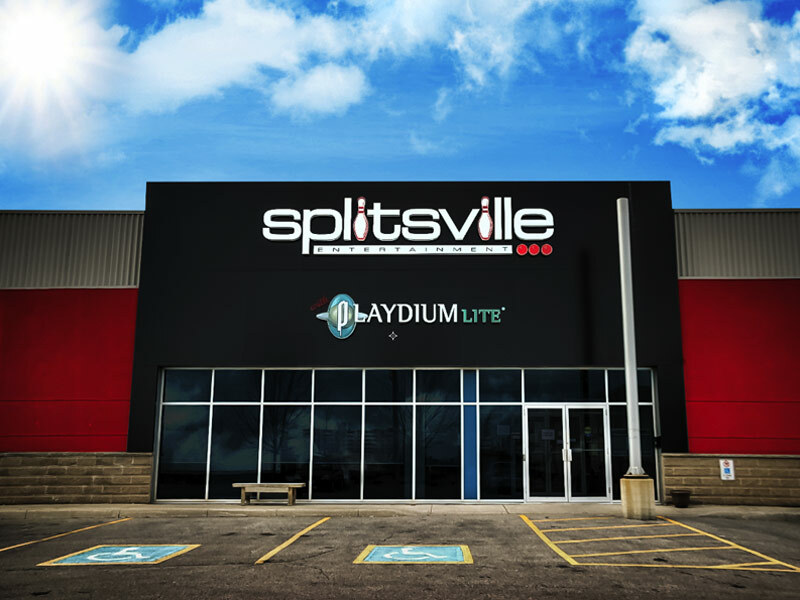 E.
© Copyright 2018 – Splitsville Entertainment Inc.